The Blue Ridge Parkway is one of the most scenic drives in the country. Traveling on this National Parkway makes for a relaxing road trip. We picked up U.S. 441 at Oconaluftee in the Great Smoky Mountains National Park. Then we headed onto the Blue Ride Parkway from that point. The Blue Ridge Parkway goes through North Carolina. Going north it eventually connects onto Skyline Drive in Virgina. This portion of the route takes you through the Shenandoah National Park. From Oconaluftee, if we had traveled south we would have been able to pick up a connection to the the Cherohala Skyway and travel through another part of Tennessee. For this road trip we stuck to the Blue Ridge Parkway. There are tons of hiking trails to be explored. Even though hotels are scarce there are several campgrounds to try. We picked up picnic supplies before we left town. There aren't a lot of places to stop on the route. Plus, there is just something extra refreshing about being in the mountains and enjoying a picnic as we take in the scenery. As you travel along the Blue Ridge Parkway you will find many places to pull off of the road to enjoy the scenery. This shot was taken from a pull off spot on the southern end of the road trip. It is ones of the best places to view the mountain. This is one of the photos that I took on the road trip. 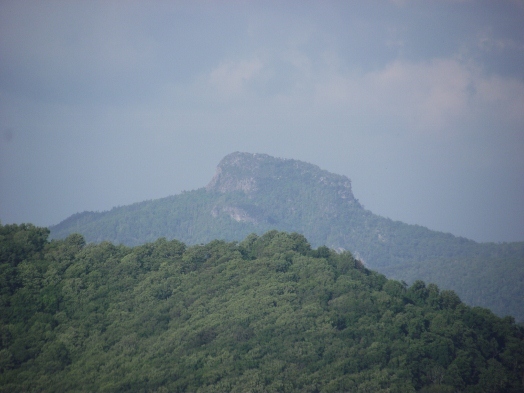 It's of Table Rock Mountain in NC in the Pisgah National Forest. The distinctive formation is difficult to miss. This scenic pull off is the best place to view the mountain. Sadly, our trip ended all too soon. One day, when we have enough time, I'd like to travel the route from the southern terminus of the Cherohala Skyway through to northern Virgina. In the meantime, I'll have to satisfy myself with memories of our trips and our photos. If you get to travel along the Blue Ridge Parkway, Cherohala Skyway or Skyline Drive let me know. It would be great to exchange stories and blog links with you.